Burris has completely reworked their XTR line of tactical scopes, we do a full test to see if they fixed the first generations shortfalls. Eye Relief: 3.50" - 4.25"
Burris Optics has been making tactical scopes for a number of years now and over that time span they have had several tactical scope offerings that have spanned a wide spectrum from budget to higher end. In fact, one of our first scope reviews we did was of a Burris Fullfield II 3-9x40mm with a simple ballistic plex reticle, which was one of the earliest scopes in the industry to offer ballistic aiming points on the reticle of a traditional scope. Our reviews have evolved greatly over the years and so has Burris’ tactical scope offerings. We reviewed a Fullfield II tactical scope which was a more tactical focused scope than the original ballistic plex scope. Over those years we never did perform a full review of their purely tactical scope known as the XTR. We have been using one of the XTR 3-12x50mm scopes on a 260 rifle for a number of years where it still sits and serves admirably. But now with Burris producing a new version of the XTR called the XTR II, we thought it was time to put their full tactical scope through the full battery of tests and see how it does. The model we are reviewing here is the 3-15x50mm model with G2B illuminated mildot reticle. The scope arrived in a well marked Burris box that included the scope, sunshade, user guide, battery for the illuminated reticle and a few other little items including flip up scope caps. The inclusion of the sunshade and flip up scope caps are always a welcomed addition, and while the caps were not Butler Creek flip up caps, they were still a pretty good quality cap and should work fine. Of course, they can always be replaced with Butler Creeks at a later date if desired. The packaging was good and while the user guide is fairly small, all of the important information that you need is in there. The overall size of the scope is larger than the traditional scope, but it is not huge like some others. The 34mm tube obviously adds some heft to the scope and it does weigh in at a solid 31 ounces, or nearly 2 pounds. The overall shape is pleasing enough to look at and the 50mm objective looks good with the 34mm tube. 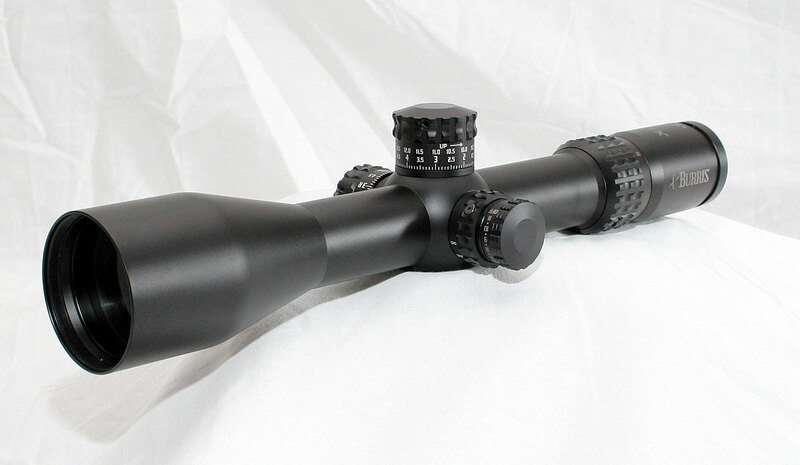 The black matte finish over the scope is smooth and even and offers a good non reflective finish. The tube is a single piece tube for added durability and many of the internal parts are also over sized and strengthened for durability, such as the double internal tension springs. The eye piece has a fast focus ocular adjustment that is moderately stiff. The stiffness makes it a bit difficult to adjust without grabbing a firm grip on it, but it also insures that it is not going to easily move from where you set it. It rotates through the entire adjustment range in just one full rotation. This makes it easy to see any reticle focus changes, but does take away from some of the precision available from a fine focus setup. The eyepiece does not have any sort of rubber on the end to cushion any impact with your head if you get too close during firing, but the eye relief is a decent 3.50″ – 4.25″. In front of the eyepiece is the zoom power ring. The ring itself has some aggressive knurling on it to help with getting a good grip on the ring when making changes to your zoom power. There are no thumb or finger protrusions so a good gripping surface is needed and the knurling does do well there. The zoom ring travels very smooth through its entire range with no roughness, though like the eye piece, it is moderately stiff and required a good grip to turn it, but this also insures there is enough resistance to keep it in place until purposely moved by the operator. The zoom power numbers are clearly marked on the ring itself and there is a single indicator mark at the top of the eyepiece. The numbers are placed on a portion of the ring that is ever so slightly tilted toward the shooter. This slight tilting does help the numbers to be seen easier from behind the scope, but since the reticle is a Front Focal Plane reticle, keeping track of the zoom setting is not as critical as it is with a Second Focal Plane scope. It needs to be noted that the entire eye piece does not rotate when adjusting the zoom power like the older Burris scopes used to do. This makes using flip up scope caps much nicer. The elevation knob rests atop a rounded shoulder and it is an exposed large style elevation knob.There is some knurling on top of the knob that is very similar to what is found on the zoom ring. The knurling provides a very nice gripping surface and then directly below it is the smooth face of the knob where the markings are located. The version of the XTR II scope we had for evaluation had MIL (MRAD) knobs with 8 full MIL of adjustment per rotation with each click being .1 MIL. That 8 MIL of rotation will take a 308 with 175gr Sierra Match King bullet all the way from 100 to 800 yards in just a single rotation. The markings on the knob has two rows of numbers, the large markings on bottom are for the first rotation and then the smaller numbers on top are to be used to once the first rotation has been passed. This is all done to help the sniper or long range shooter to keep track of where they are in the adjustment range. If the two rows of numbers doesn’t keep the shooter from getting lost, there are no worries as the elevation knob has a zerostop as well. 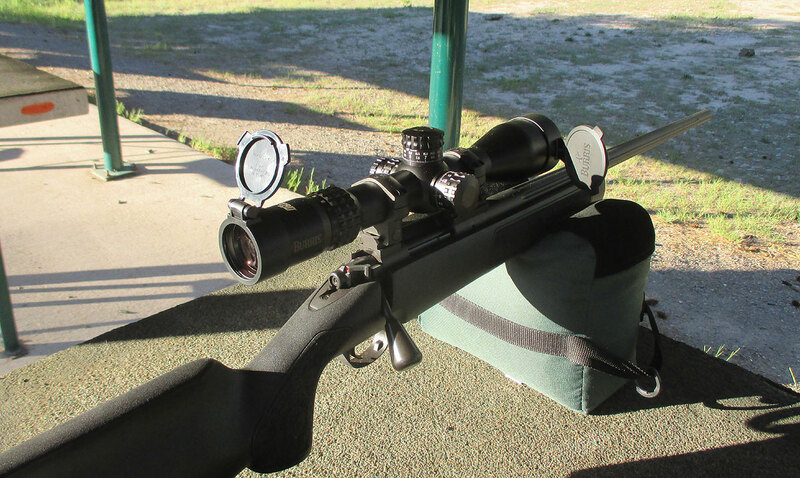 Once the zerostop is set, if the shooter loses track, he or she simply needs to crank it down until it stops, which will be at, or near the 100 yard zero for the scope and rifle. The clicks on the knobs are a precise and firm click that has a slightly muted sound. There is no mushiness at all to the click and the knobs have a nice quality feel to them. There are “up” markings at the very top of the smooth face of the knob and they are placed several times all around the knob so that the direction indicator is always visible in case the shooter needs to be reminded. Perhaps the greatest advantage of the larger tube size on moderns scopes is the amount of adjustments that can be engineered into the scopes. This XTR II has a 34mm tube and with the 15x maximum power, it allows for a large amount of adjustments, a full 110 MOA on this scope. Interestingly, Burris indicates that their mechanical zero is engineered to be 20 MOA below halfway which gives more up elevation to be used to begin with, and then when combined with a canted base allows for even more up elevation to allow for some extreme range shooting. The of 15x magnification would be the limiting factor in determining how far you can engage targets with the scope, but it should be good to 1500 yards on man sized targets and there are plenty of vertical adjustments to allow for those ranges. The windage knob on the right hand side of the scope is the same size and shape as the elevation knob and has the same 8 MIL of rotation per revolution as the elevation knob. The markings go up in both directions with the overlap happening at four MIL which is enough to allow shooting a 308 in a direct 10 MPH crosswind out past 1300 yards before having to worry about the overlap and getting confused. Each click is .1 MIL and there is a total of 55 MOA, or about 16 MIL, of windage adjustment, which is plenty for any feasible shooting with this scope. The clicks have the same nice firm feel to them and we like the R and L markings next to each whole number to provide a good reminder to the shooter which direction of wind adjustments might be dialed in. On the opposite side of the scope than the windage knob is both the focus knob and the illuminated reticle controls. The controls are stacked with a larger knob closest to the shoulder being the side focus knob and the smaller diameter illumination control being mounted on top of the focus knob. The focus knob has the same knurling on it as the other knobs and it rotates smoothly, though again, a little stiff. It focuses easily from 50 yards up to infinity with the markings getting tighter the further out the distance goes. The span of the entire adjustment range covers about 75% of the diameter of the focus knob. The placement of the illumination control can make it a bit awkward at times to reach and rotate the focus knob, but for the most part it works pretty good. The illumination brightness control knob has 11 different brightness settings with an off detente between each setting. This is a good setup as it allows the operator to easily go from off to their desired brightness setting with just a single click instead of having to cycle all the way through the rest of the settings. The brightness clicks were solid and offered no doubts about the next setting having been reached. The knurling on top of the brightness knob is different than the others, but it is still useful enough to provide a good grip. The scope tapers nicely from the forward tube to the objective lens. The 34mm diameter tube is a nice visual match to a 50mm objective lens and with the nice matte finish over the entire scope, it has a pleasant appearance. 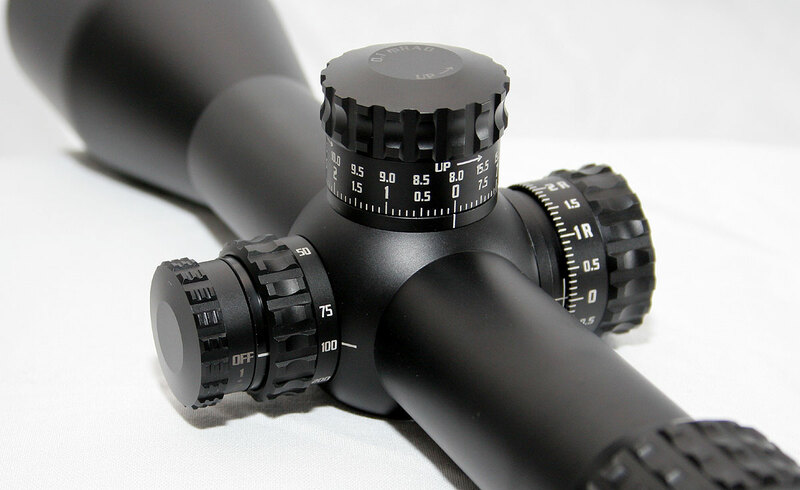 The overall fit and finish of the scope appears to be of a high quality and with the smoothness of the controls and good quality clicks it gives us a good feeling that the quality of the scope on a whole is solid. This version of the XTR II came with what Burris calls the G2B Mildot reticle which incorporates a standard Mildot reticle with some additional hashes at the half mil intervals. These hashes aid the operator to be even more accurate with their MIL measurement estimations when performing range estimation calculations. There are also very large hash marks at the 10 MIL point on the thick horizontal and vertical statia which helps in those rare conditions when the operator needs to MIL something that is either very close or very large. 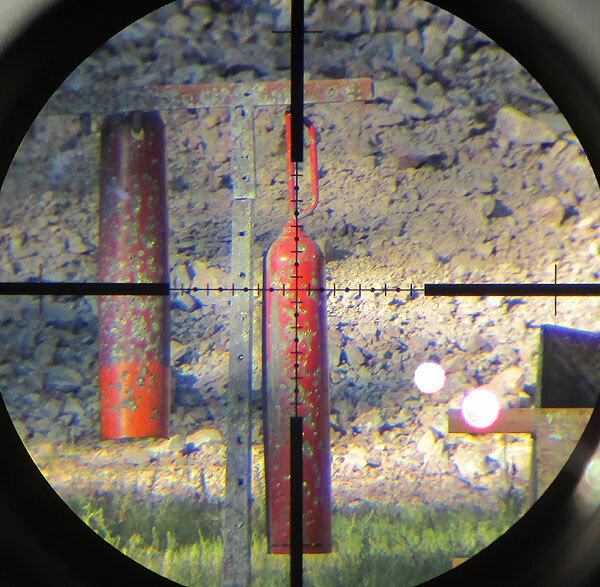 The reticle is located on the First Focal Plane (FFP) so it grows and shrinks with the zoom magnification. Of course this makes life easy for the operator as they do not have to worry about always checking the zoom power to be sure its on the correct settings when doing range estimation. But with the wide range of zoom power available, the engineers have a challenge of selecting a correct reticle thickness to allow the reticle to still be seen at the lowest power setting but yet not be too thick at the highest setting as to obscure the target or not allow for precise aiming. Burris elected to lean more toward a thinner reticle statia to allow it not to cover too much of the target when zoomed in to 15x, but down at 3x the reticle gets lost when looking at any background that has clutter. We feel this is not a problem as a typical sniper rifle is seldom fired at the lowest zoom power (3x in this case) and even when it is, the gap between the visible large stadia is small and it can still be used as an aiming point easily enough in emergency situations where engagements might happen at that lower power setting. 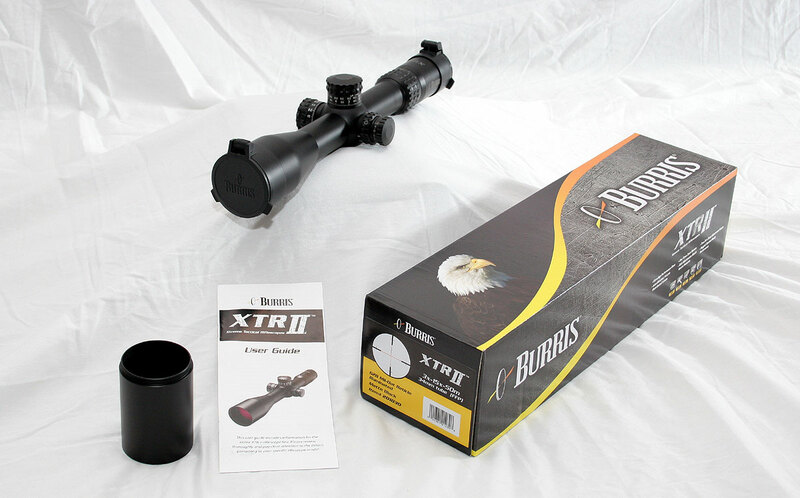 The optics and lens coatings on the XTR are very nice and appear to be properly matched to other scopes in this price range. Optical quality continues to be the hardest part of these scope reviews and we do not have any “objective” way to measure quality, so the results come down to “subjective” opinions by us. We noticed good light gathering in low light situations (dusk and dawn and overcast situations) and we found good contrast in those low light situations. Perhaps at some point we’ll be able to come up with a way to actually measure the optical performance, but for now, we’ll just have to say that the picture is bright and clear and sharp from edge to edge. With all of the details of the scope examined and discussed, it was time to put the scope through some actual mechanical tests to see how everything was working internally. The first set of tests we do is to mount the scope into a fixture and then hang a plumb bob to use for testing vertical tracking. We level the scope with the crosshairs right on the string, and then we go through two full rotations of up elevation to insure the crosshairs stay right on the string as it moves up. The XTR did very well without any noticeable wavering along the string. The next test we did was with the scope still mounted in the fixture, we put the crosshairs on a fixed aiming point and then rotate the zoom knob through the entire range and insure that the crosshairs stay fixed on the same aiming point and does not wander, and again, the XTR II did very well without any noticeable shift in the aiming point. For the shooting portion of the tests we decided to use a different rifle than normal. We had some Eagle Eye 223 69 grain match ammo we wanted to test out and we had a Kimber 84 LPT rifle here chambered in 223, so we decided to use this rifle for the shooting evaluation. We then used some Leupold Mk4 34mm rings (highs) to mount it to the steel picatinny rail that was already mounted to the Kimber action. The rings were perhaps just a tad high for the scope, but everything mounted up easily and buttoned down nicely. After performing our initial zero at 100 yards, we ran the scope through a 1.5 MIL box test where we shot a group at each corner of a box using the same aiming point but adjusting 1.5 MIL between each corner. This tests the repeatability of the adjustments as well as gives us a feel for the correct adjustment sizes. Everything checked out very good with the last group landing right on top of the first group and the box sides being right where they should be for 1.5 MILs at 100 yards. We then did our traditional adjustment size measurement test by shooting one group and then dialing in 6 MIL of left and firing another group, and then finally dialing back in the 6 MIL of right and firing a third group which should be right on top of the first. We then measure the distance between the two group sizes to see how accurate the click sizes are. We know there is some error in the test due to group sizes which introduce some measurement error, so we consider anything with less than 5% error to be acceptable, and less than 3% to be very good. With the XTR II, the third group did indeed return exactly back to the original point, proving good repeatability, and the group sizes measured 21.72″ apart. At 100 yards, 6 MILs equates to 21.6″ which means there was less than 1% of error (0.56%) which obviously falls into the very good range, so we knew the click sizes were right on. We did dial in dope for a 400 yard engagement and engaged an obscured target against a complex background to test the contrast capability of the optics, which were good, and then dialed back down to the 100 yard zero and fired again to do one final test of repeatability, and again, no issues. The tests were conducted during early morning hours on a clear day at about 50 degrees temperature. All and all, we liked this XTR II scope. We have used a number of the other Burris semi-tactical scopes and have not been thrilled with the results of those models, but this XTR II impressed us enough with its features, capabilities and quality that we would seriously consider employing one on future rifles. They have both MIL/MIL and MOA/MOA versions of the scope to suit the desires of both camps and Burris also offers the “Forever” warranty which is even transferable to a new owner. The scope is not perfect, but it is very solid for the $1000 range and is certainly worth considering. I had a 308 built and I put this scope on it. I have been quite impressed with this scope. Was skeptical at first, being a Burris, but like you said, Burris has stepped it up a notch. I also bought one for my 300wsm and it has worked flawlessly on Mule Deer and Elk. Very rugged scope. Just ordered the 5-25×50 model. You should check out the new steiner tactical & military models. The burris, I think, is sister to the steiner’s now. The build is almost the same as the Burris, but the glass is awesome. Right on par with my S&B. 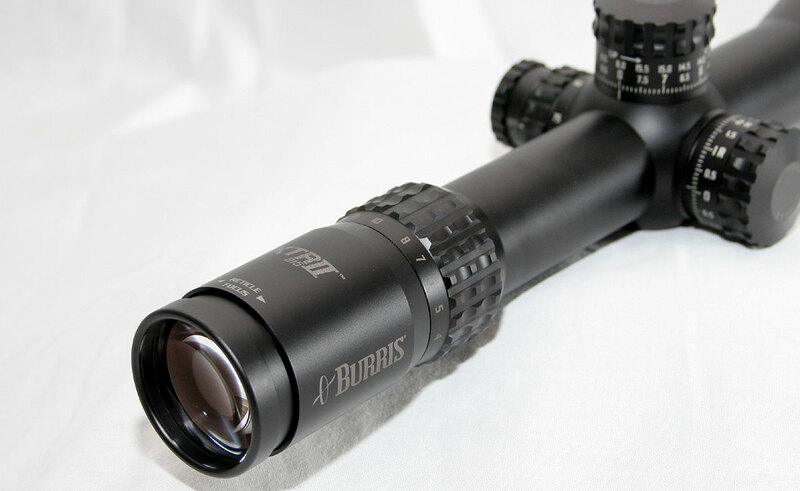 If the Burris is anything close to the Steiner it should be one of the best value scopes in this price range. Thanks for another great review. Burris xtr 2 or a bushnell elite tactical 3.5x21x50 dmr? This is a very good question! The DMR scopes from Bushnell are quiet nice and performed well in our reviews as well as some in depth optical comparison reviews as well. We really like the XTR2 also as it has all the right features with solid performance and quality, and for a bit less money. This would be a hard choice to make and both options are a solid choice. Placed one on a .308 I built. Very satisfied. Glass is very clear. Clicks are solid, Turrets are a little stiff but with time will smooth out. Repeatability is very good. Scope holds a solid 0 from shot to shot. A very good optic for the price. Am planning to put a 5×25 XTR II on a .300 Win Mag. I am now working on. Don’t think anyone will be sorry for putting a XTR II on top of any rifle. What would be a good set of rings for the 5×25 XTR II to get it close to the barrel of a Ruger Precision Rifle in 6.5 Creedmoor? That is a fine question. The XTR II has a 34mm tube and right now ALL 34mm rings are quiet high. I would try the lowest Nightforce extreme duty 34mm rings or perhaps even the Burris XTR 34mm rings. It should be mentioned that the Burris 34mm rings are actually steel, unlike their XTR 30mm rings which are aluminum. Vortex and Leupold also have 34mm rings that are excellent… I would just recommend getting the lowest height ones, which will likely be plenty high for the 50mm objective. What size rings did you use, if you don’t mind?? do u have a part #? Between this or a mark 4 leupold 4-14×50 with the m5 knobs on a 308 which do you think is the better optic? That is a very good question. Both are very good and I would be happy to use either one. The Leupold has a longer track record and the Leupold customer service backing it up, but the XTR II has all the right features and so far the quality has been very good. I have two XTR II scopes. The only problem I have had, is with the battery cap. Twice, the cap has unscrewed and has been lost in the field. The first time I thought it was just me and did not have it on tight. But the second confirmed it was a scope problem. Each time, I called Burris and they sent me out a free one. It only happened when I was dragging the gun around in heavy brush. I got to figure a way to keep that cap from getting lost. Wish it came with a dummy cord. I LOVE the scope!!! Have in Mil and MOA. Interesting, and good, point. We have not noticed this as of yet. It may work to put a tiny dab of blue (must be blue!) locktite to hold it in place. Just a tiny dab should hold it but yet still allow you to remove the cap when time for a battery change. I’m not totally comfortable with this, but it may be an option. I was on the fence, finally decided on the 3×15 as my starter ELR scope – this review helped me feel ok about dropping the coin (a lot for me) . Sits on a 300 win mag, 20 moa steel rail, Burris XTR Signature low rings. So far I couldn’t be happier. The reticle switch is a little funny, but it works, hasn’t failed. Knobs are ok, solid clicks. Great eye relief. The glass isn’t flawless, but for $725 (with $100 Burris rebate) I didn’t expect it to be. Oh yeah, came with 23.3 mil dial up! Probably won’t need the 40 moa adjustability with the scope ring inserts, but all that extra vert is sure nice to have in your pocket. I have the 3-15×50 with SCR MOA reticle. Where can I find a reliable ballistic chart to help me correlate clicks? It is installed on a Savage 112BVSS .300 Win Mag. I have to admit I am new to long range “attempts” and need all the help I can get to understand MOA/inches/clicks. I am target shooting only with buddies. Not relying on bullet placement for wild game as I don’t trust myself for ethical shots yet.